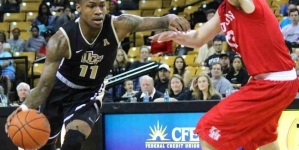 The #12 Houston Cougars were too much for the UCF Knights men’s basketball team on Thursday night, winning 69-65 in CFE Arena. 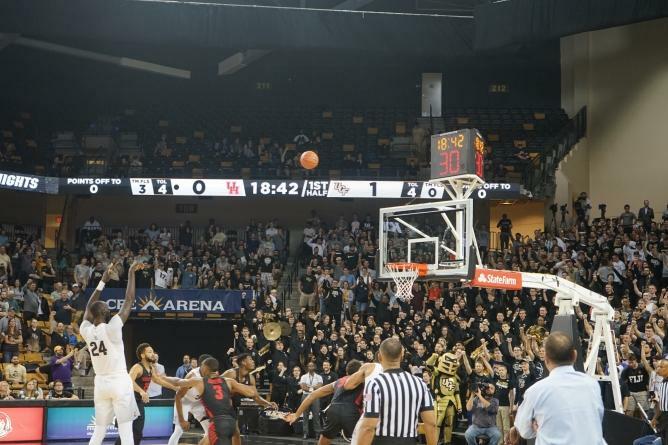 UCF’s (17-5, 7-3 American Athletic Conference) offensive play was not strong enough in the first half and the Knights found themselves playing from behind. Houston (23-1, 10-1 American Athletic Conference) started off strong, which ultimately led them to a road victory. The Cougars played productive offense and defense and held a comfortable 37-28 lead at the end of the first half. Corey Davis Jr. played well for the team with 15 points, and made a clutch jumper with 3:24 left on the clock in the second half. Rob Gray led the team with 21 points averaging about 47% FG and 5 assists. Taylor shot 6-12 with 4 assists and led the team with 15 points. He came through with a jump shot and layup with less than 3 minutes left in the second half. A.J. Davis had 10 rebounds and scored 13 points for the team. Although UCF gained momentum at the end of the second half, it just wasn’t enough to land them a victory. 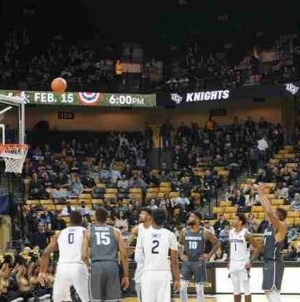 However, the Knights rebounded on Sunday with a 71-65 victory over conference rival Southern Methodist University.